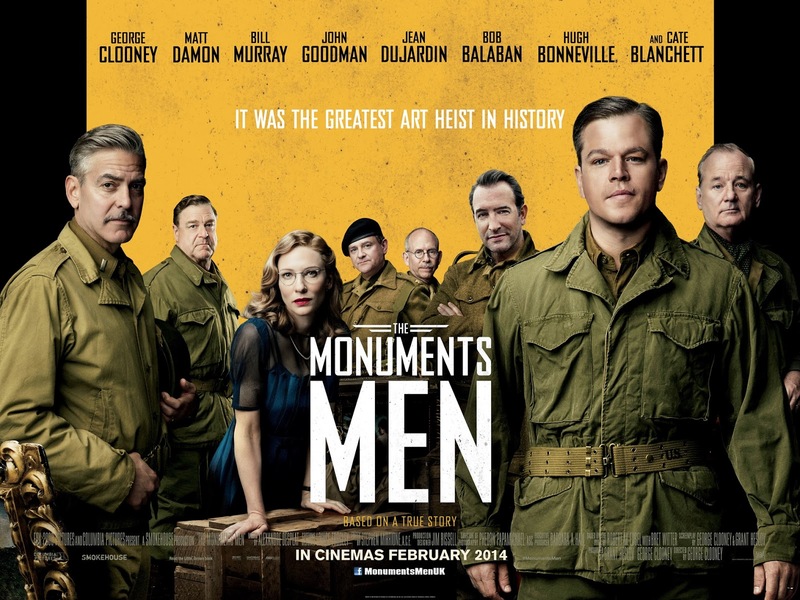 The first major cinematic disappointment of 2014 goes to George Clooney's eagerly anticipated directorial vehicle The Monuments Men. Clooney impressed with 2011's The Ides of March showcasing a filmmaker who appeared to have perfected his craft - as well as teasing strong things for his follow-up project. With an ensemble cast featuring Clooney, Matt Damon, John Goodman, Bill Murray, Cate Blanchett, Hugh Bonneville, and Jean Dujardin proceedings seemed equally promising. However, the end result is a tonally chaotic yet lifeless piece of filmmaking that squanders its prestigious talent. The Monuments Men are a group of art scholars tasked to rescue artworks that are stolen by the Nazis and scattered around Europe amid the conflict of World War II. Clooney and Grant Heslov adapt the screenplay from Robert M. Edsel's 2009 book of the same name. The premise delivers an intriguing take on WWII - one that may be new to most viewers who are used to seeing World Wars depicted through their military action or behind the scenes politics.Unlike these other depictions of the conflict, The Monuments Men cannot seem to decide what sort of film that it wants to be, failing to commit to any solid tone or narrative direction. It is light, unassuming viewing that never delivers enough dramatics, action or humour to present itself as anything more than George Clooney and his pals having a jaunt around Europe. This may be the fault of a bizarre narrative structure that divides the film into a multitude of unfocused subplots. Clooney teams up with Dimitri Leonidas who plays a character so ill-defined that he is continually lost in the background of his scenes. Murray and Bob Balaban are paired - both fine comic actors who fail to make any impression in The Monuments Men (I struggle to think of more than a couple of the character's gags almost an hour after watching the film). Whilst Goodman and Dujardin are swiftly sent on a wild goose chase, and Damon's gormless American art scholar attempts to arrange a play date with Blanchett's inexplicably cold French resistance supporter. Combine this off-key structure with schmaltzy monologues about the power of art and often plain stupid dialogue between the characters and you will gain an impression of how Clooney's picture is shaping up. While the more light-hearted elements flounder and fail to make any impression, The Monuments Men never quite touches on the hard-hitting emotional level of conflict or the harrowing effects of the Nazi's acts of despicable cruelty. Perhaps in its attempt to combine the two, we gain this unyielding and uneven structure that leaves us feeling empty and unmoved. There is some pleasant cinematography from Phedon Papamichael who captures Europe at its most beautiful even amongst the ravages of war. A stellar soundtrack from Alexandre Desplat delivers a similar prestigious character to many a classic war film of the 1950s and 1960s. These redeeming qualities fail to fill the vacuum that is left from the film's uneven tone, awkward narrative structure and squandered cast. Clooney's intentions are good, but The Monuments Men is an unsatisfying slog that lacks both the charm and quality that we associate from the likeable actor. To see a similar concept done well, check out Franco Zeffirelli's Tea With Mussolini. Originally feature on The People's Movies.